A segment along the street of the Junction Business Improvement Area. A Business Improvement Area (BIA) is an association of commercial property owners and tenants within a defined area, who work in partnership with the City to create thriving, competitive, and safe business areas that attract shoppers, diners, tourists, and new businesses. The Streetscape Manual includes many streets that are part of a Business Improvement Area. 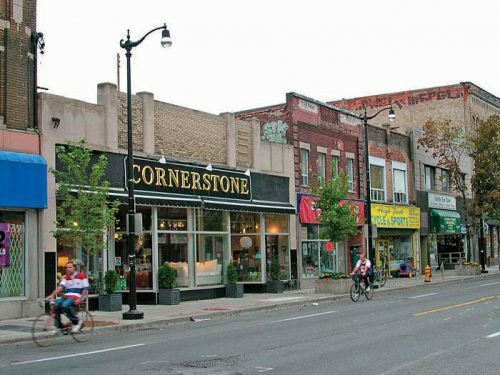 Streetscape designs within the boundaries of a BIA are frequently customized to enhance or create a local identity. Where applicable, the Manual identifies streets within BIAs and a link is provided to the City of Toronto’s BIA website for further information. When planning a streetscape project within one of Toronto’s BIAs, please contact City BIA staff.